Reigning 125GP champion Marc Marquez has moved to within six points of championship leader Stefan Bradl with victory at Aragon after an epic battle. It took Marquez 14 laps to make his way to the front and pull away from the rest of the pack. Marquez passed Andrea Iannone across the start/finish line to lead in to the first turn. Iannone was desperate to take the lead back instantly and ran wide in to the first turn, giving the Spaniard the space he needed to put in a fast lap. 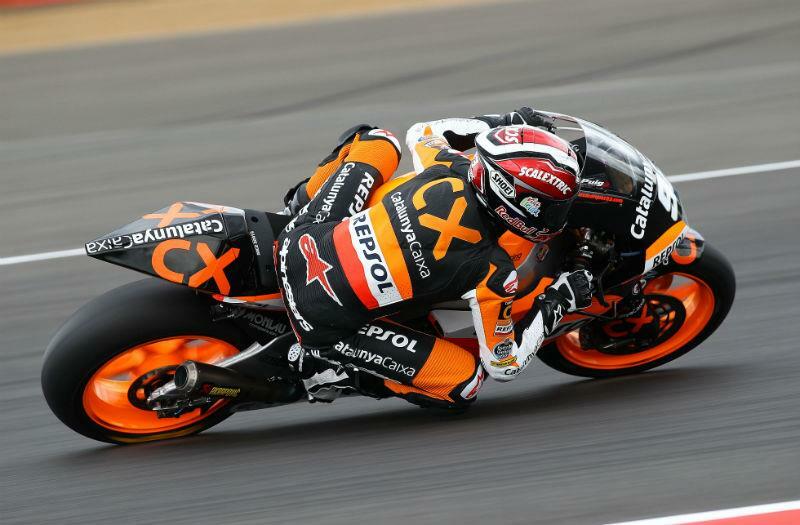 Britain's Scott Redding got the holeshot to lead Marquez, while Bradl managed to force his way up to third. Redding, Bradl, Marquez and Iannone then battled for the lead, attacking each other at every opportunity. The heated battle for the lead allowed Simone Corsi and Alex De Angelis and by the half way stage nine rider's were in the leading group battling for the lead. Bradl and Redding both suffered in the later stages of the race and both rider's slipped down the field to finish eighth and 15th respectively. Briton Bradley Smith - starting 15th on the grid - battled his way through the field to finish in an impressive sixth, despite being 18th at the end of the first lap.